Susan has well over 30 years of experience in software development. 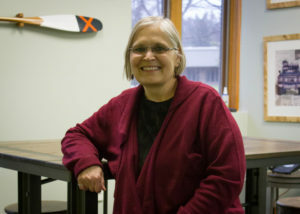 Her interest and expertise began with machine language applications for Disney and grew, along with the industry, through computer graphics for film and video, through years of teaching programming languages at the University of Detroit Mercy, into web-based technologies which she applied building web applications for the State of Michigan. Susan has a bachelor’s degree in Computer Science from University of Central Florida and a master’s degree in English Education from Michigan State University. Susan joined Red Cedar in 2018 and works on the Stepwell project. Along with Susan’s interests in computer programming and learning the next new technologies, she is a fiber artist who creates quirky art clothing and spends an extravagant number of weekends at art fairs with her creations.